You can display data of the multiple volumes that you have grouped in the different views. In the Control Panel, go to the View menu, and open the IL/Gather/CL View. At the Vol box in the navigation bar, select the volume group to display. 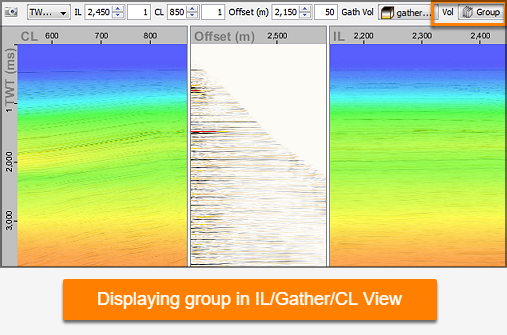 The example shows an IL/Gather/CL View. In the left and right panels, the velocity is displayed with the full stack and gather volumes. In the middle panel, the section view of the gather volume is displayed. A group of 2D and 3D volumes can be created to view multiple volume datasets using an arbline. For more information, see Viewing Data Along Arbline.